There is nothing better after a long day than a bowl of Instant Pot Jambalaya with a cold sweet tea for dinner. 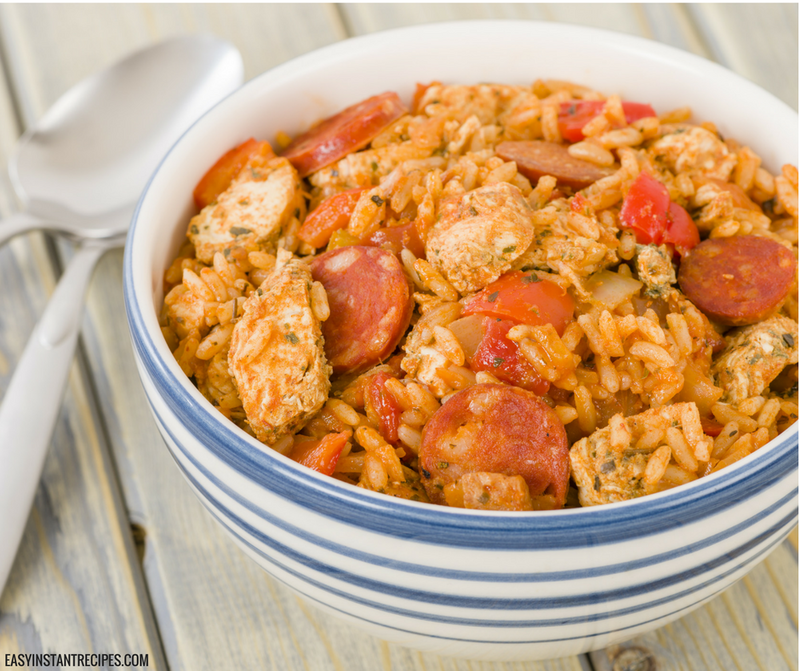 This jambalaya with brown rice recipe is one of my favorite comfort foods, and I am sure it will quickly win it’s way into your heart too! Before you make this recipe make sure to head over and read on how to cook brown rice in the instant pot. It is slightly different than cooking white rice in the instant pot. If you are not a brown rice fan, simply switch it for white rice and viola you are good to go! I personally love to make our Instant Pot Jambalaya with Chicken, Andouille Sausage, and Shrimp.These three items though are completely optional so feel free to leave any them out if you desire. I know when I tend to make this for my kids we leave out the shrimp and it tastes just as delicious. One item though that you cannot leave out is the Tony Chacheres Creole Seasoning. It definitely adds a depth of flavor that you shouldn’t skip! Return chicken to pot. Add rice, crushed tomatoes and chicken broth. Mix well. Cover and set pot to rice. "High Pressure" at 12 minutes for white rice or 22 minutes for brown rice. Quick release. Add sausage in a layer on top of rice. Then if desired, place shrimp in a layer on top of sausage. Set pot to cook on manual mode for 2 minutes. Not making this Instant Pot Jambalaya right this second? Then pin this post so you can easily find it later!